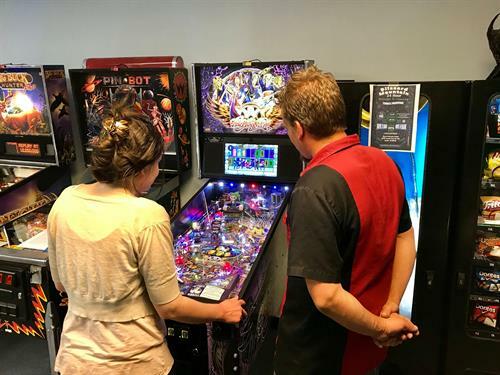 Blizzard Mountain Pinball proudly presents our weekly Monday night pinball league! Starting at 7pm on Monday, September 24th and going for 10 weeks plus a fun and friendly playoff on week 11. Every week you play in a group of 3-4 players on 5 different pinball machines. You get 4 points for a win, 3 for 2nd place, 2 for 3rd place, and 1 for 4th. There is a bonus point available on each game for the highest score of the evening. Each week the groups will change based on everyone's overall record up to that point. Cost: League dues are $40 total per person (only $4 per week! ), plus the cost of games played. The total $40 is due week 1. (Cash only, due to credit card processing rules.) On week 11 (December 3rd), there will be an end of season playoff, and payout of 100% of the league dues to the top players. If we have enough players, we will split into 'A' and 'B' divisions for the week 11 playoff. Starts September 24th at 7pm!